Glad to hear it isn’t just me. Fortunately, there’s lots of experimentation going on with ingredients other than hops. I’m finding lots of incredible sours lately and the Crooked Stave Wild Wild Brett series is playing with some wild yeast in very interesting ways. Was it Greene King IPA by any chance? I seem to recall that they hailed from East Anglia. Damn, I cut my teeth on that stuff before switching to Abbot Ale (a very fine tipple) and then Guinness (much kinder on one’s peptic ulcers). If perchance it was, I never thought GK IPA actually burned; I just assumed it was Satan’s stale urine. Nasty. It may well have been Green King, aye, I do remember having to spit out a mouthful of it on another occasion. One good thing about hops? Yes, they help you calm down. Relax, mon. 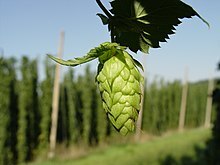 Now, I have been reliably informed that the hops plant is related to another green plant historically used in the manufacture of rope. Apparently it is possible to graft hops plants onto the root-stock of the, uh, “rope plant”, thus growing a strange hops plant that is, uh, no good for making rope but should never be discarded on the bonfire, if you get my drift. Or not. Delta-9-tetrahydrocannabinol is soluble in alcohol; the first person to brew such a hoppy beverage should be awarded a family-size pack of cookies and any album by Hawkwind.